Robert Rodriguez 2017 NDEAM Champion | East Coast Orthotic & Prosthetic Corp.
Congratulations to our amazing Patient Advocate, Robert Rodriguez. Robert has been chosen by The Corporate Source (www.thecorporatesource.org) to be the recipient of the 2017 “NDEAM Champion Award.” October is National Disabilities Employment Awareness Month (NDEAM), which is observed by the Federal government statute for advocacy of people with disabilities in the workplace. Robert was nominated by East Coast O&P for this award because of his outstanding character, hard work and dedication. He was presented with the award on October 31st in our Deer Park corporate HQ. He has served as an inspiration to both young and old for what can be accomplished with perseverance, hard work and positivity. Robert Rodriguez, who lost his leg below the knee, says he’ll donate a portion of his $3,000 prize to a camp for children who have lost limbs. Four years ago, Robert Rodriguez, a Bay Shore amputee, inspired a young girl to wear her prosthetic proudly. This week, the girl’s family helped return the favor. On Tuesday, Rodriguez, 30, was given the National Disabilities Employment Awareness Month Champion award by The Corporate Source, a Garden City-based nonprofit that creates employment opportunities for individuals with disabilities. 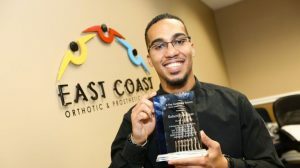 Rodriguez, whose right leg was amputated below the knee when he was 10 months old, was nominated for the distinction by his employers at East Coast Orthotic & Prosthetic Corp., which is owned by brothers Larry and Vincent Benenati. Rodriguez first met the Benenatis by chance. He was trick or treating with his daughter in 2013 when they ran into Vincent Benenati’s wife and daughter. Vincent Benenati’s daughter is also an amputee but had refused to wear a prosthetic until Rodriguez helped her see its advantages. A few months ago, the Benenatis nominated Rodriguez for the NDEAM award, for which anyone currently working on Long Island with any type of disability can apply, according to The Corporate Source’s CEO, Michael Kramer. Rodriguez was chosen out of a pool of 10 applicants. Kramer said he stood out to the panel of four judges for his enthusiasm and commitment to helping other amputees. Rodriguez wears many hats at the Deer Park-based prosthetics company. He’s involved in business development, marketing and patient advocacy, but also runs a support group for recent amputees and often drives patients to and from medical appointments, according to Larry Benenati. Rodriguez was honored at a ceremony Tuesday and given $3,000 by The Corporate Source and the Claire Friedlander Family Foundation in Huntington. He plans to donate some of the money to Camp No Limits, a nonprofit that stages therapeutic camps for children with limb loss, he said.